Google just hired Ruth Porat to be its chief financial officer, and is paying her a reported $70 million. You’d think that’s a sign things are looking up for women in the tech industry. Not quite. Google just hired Ruth Porat, a former Morgan Stanley executive, to be its chief financial officer, and is paying her a reported $70 million. You’d think that’s a sign that things are looking up for women in the tech industry. The percentage of computing jobs held by women has actually fallen over the past 23 years, according to a new study. In 2013, just 26 percent of computing jobs in the U.S. were held by women, down from 35 percent in 1990, according to the study released Thursday by the American Association of University Women, a nonprofit that promotes gender equality. During that same period, the number of women earning computing degrees also declined. The decline is striking but not entirely surprising. A recent flurry of reports from some of the most prominent tech companies, ones that did not exist in 1990, offer some depressing numbers. At Google, women make up 30 percent of the company's overall workforce, but hold only 17 percent of the company’s tech jobs. At Facebook, 15 percent of tech roles are staffed by women. At Twitter, it’s a laughable 10 percent. For non-technical jobs at Twitter (think marketing, HR, sales), the gender split is 50-50. It’s not like this in other parts of the so-called STEM professions (that’s science, tech, engineering and math). In 2013, more than half of the biological scientists in the U.S. were women, compared to 42 percent in 1990, according to the AAUW’s report. That's because women tend to gravitate to biology and because the stereotype of men being superior to women in life sciences is going away, report co-author Christianne Corbett told The Huffington Post. In computing, the stereotype of male superiority has proved more stubborn. “The number one thing holding women back is stereotypes,” Corbett said. "The stereotype is that girls and women are not as good at math and science as boys and men are." "There's evidence that by first grade, most kids already associate math with boys," she said. "This is just a belief most of us have. It's a reflection more of our culture than anything individual." Those prejudices tend to make their way into the hiring process. Both male and female hiring managers often view women as less competent in math or tech. Men are twice as likely as women to be hired for a job in mathematics when the only difference between candidates is gender, according to a study published in a recent issue of Proceedings of the National Academy of Sciences. For women who do choose computing, and who wind up in technical jobs, companies need to make a “welcoming environment” for them, said Corbett. Part of that is setting up a process that deliberately encourages diversity in hiring and retention. Some companies are trying. Google is devoting resources to workshops on unconscious bias. Recently, Judith Williams, Google's diversity manager, called out company Chairman Eric Schmidt for behavior that seemed biased. But experts argue that workshops aren't enough. Rather, they say, diversity needs to be made a clear priority at companies. That happens when diversity moves out of workshops and becomes factored into the hiring managers' bottom lines. Managers at Chevron, for example, are rated in their performance evaluations on their ability to reach diversity goals, said Executive Vice President Michael Wirth at a Thursday conference in New York focused on diversity in the workforce. At Procter & Gamble, managers’ stock options are tied to diversity goals, according to the company’s chief diversity officer, William Gipson. P&G does robust hiring for tech and engineering positions, and more than half the people it now hires are women, according to the company. “Women are underrepresented,” said Corbett. “But it doesn’t have to be that way." Unfortunately, many prominent firms in the tech industry aren’t there yet. Indeed, Kleiner Perkins Caufield & Byers, one of the most high-profile venture capital firms in Silicon Valley, is currently awaiting a decision in a major gender discrimination case filed by a former female partner. There's a pressing need for talent in computing and engineering. 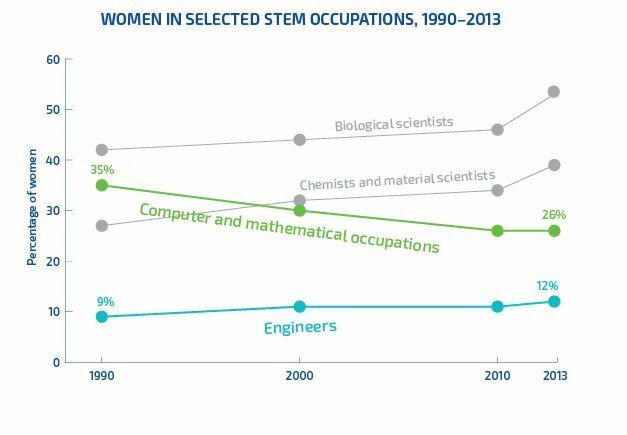 Such positions represent 80 percent of available STEM jobs and are a hugely growing area, according to the AAUW report. “There will be a war for technical talent,” General Motors CEO Mary Barra told attendees at Thursday's conference. Barra said it is crucially important to get more women into tech roles, and suggested that parents and teachers start encouraging girls early on to stick with math and science.